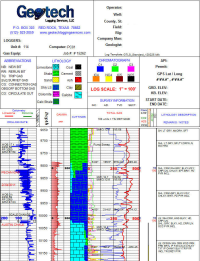 Used by geoscientists since 1983 to display their geotechnical, environmental, geophysical, mud/gas, and mining data as a graphic boring log. 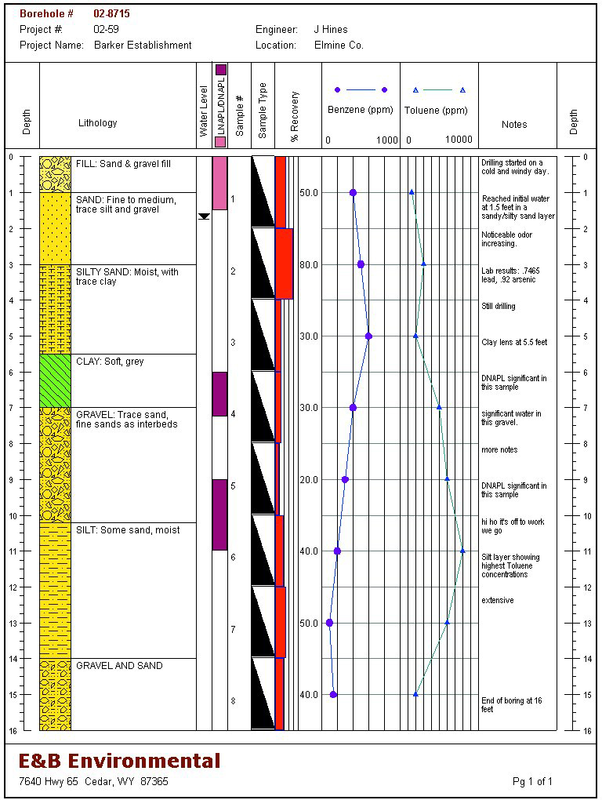 LogPlot is an easy-to-use log plotting program with a flexible log layout and intuitive data editor. 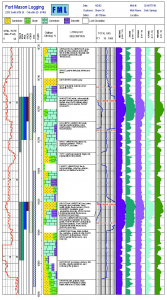 LogPlot software has been used by geoscientists since 1983 to display their geotechnical, environmental, geophysical, mud/gas, and mining data as a graphic boring log. Plot single-page logs for shallow borings or multi-page/continuous logs for deep wells. Share logs with clients via PDF or post HTML log pages on your website. Export single pages or continuous logs to JPG, BMP, TIFF, and PNG images. After using this software for over 3 years, I have to say, I LOVE IT! 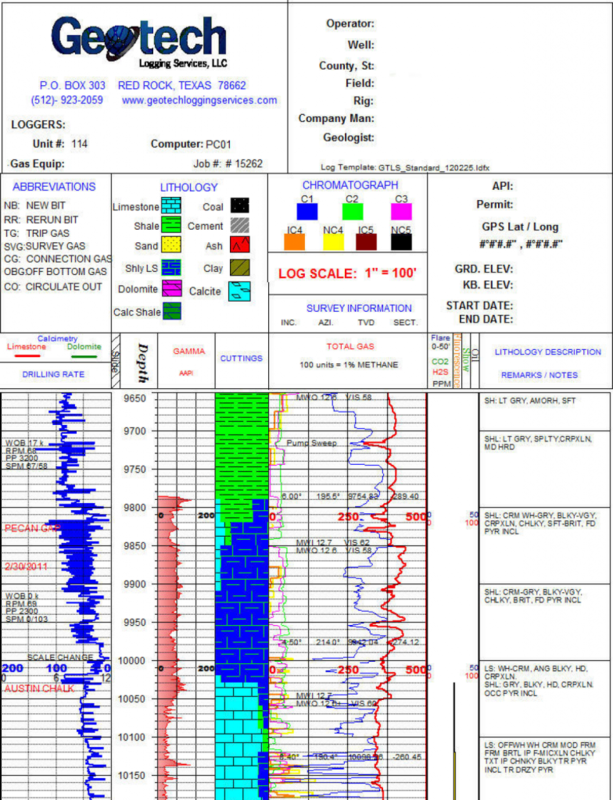 LogPlot offers a comprehensive set of borehole log software features including the Log Designer, Data Editor, Log Viewer, and much more. New in LogPlot8: Text formatting, Unicode, filled patterns, streamlined interface, exports, network license manager, and much more. 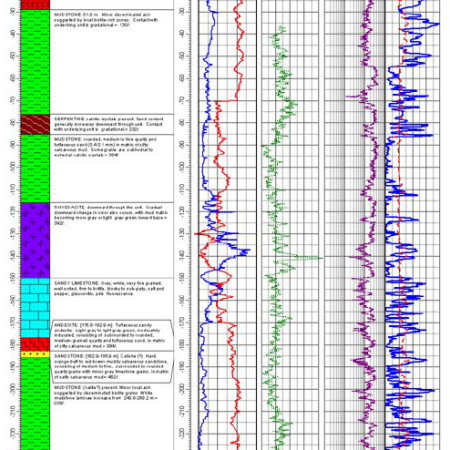 LogPlot8's extraordinary flexibility has made it a popular software program for generating well logs / boring logs / drillhole logs in numerous earth science industries. 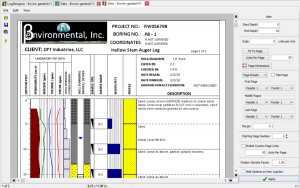 Create/modify log templates fast and easy using this graphic editor. The "body" of the log is where the downhole data will be displayed, such as lithology, sample measurements, water levels, etc. The LogPlot Data Editor displays different blocks of data (lithology descriptions, curve listings, etc.) in tabbed data "pages" where you can type, point-and-click, cut-and-paste, or import the information. 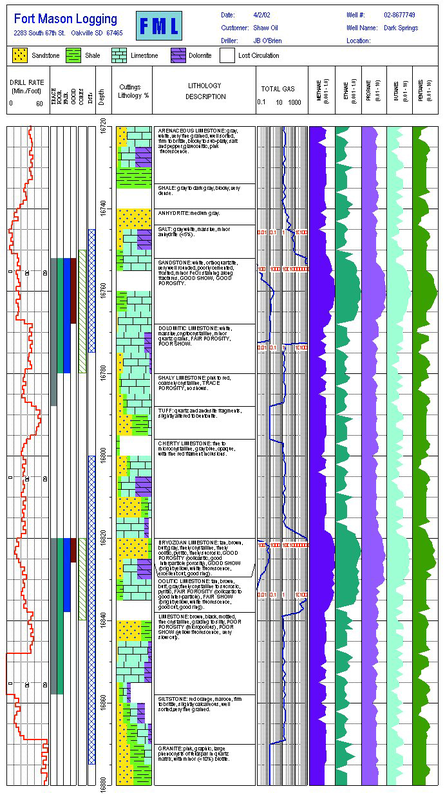 Graphic logs are displayed in the Log View window. Adjust plot parameters, print, and export. What operating systems does LogPlot8 support? LogPlot8 should install, license, and run properly in Windows 7, Windows 8, and Windows 10. It is available with both 64-bit and 32-bit versions. The 64-bit version supports longer logs and faster processing, and requires a 64-bit version of Windows. You can run LogPlot on a virtual machine on a Mac Computer running Windows, but it will not install directly to a Mac. The RockWare Network License Administrator – for network licenses – runs under Windows Server 2008 (or newer) or Windows 7 (or newer). What types of licenses are available for LogPlot? A Single license can be installed onto a single computer. It is activated with a code specific to that computer, issued by RockWare. The license can be transferred to a new computer or different user by following the transfer instructions listed below on this FAQ page. Single licenses cannot be accessed across a network and are not a shared license type. This license can be upgraded to a Network license by paying the difference in price. A Network license is a shared license type. Any potential user may install LogPlot on their local computer. A separate License Manager program is installed on a server or other network computer and activated for X number of concurrent users. When a person launches LogPlot on their local machine, it looks to the License Manager to see if a seat is available and, if so, it will start. The License Manager can be configured to permit users to borrow a license when not connected to the network (e.g. in the field) for up to 60 days. Additional seats can be added by paying the difference in price. How do I download the LogPlot demo? Go to the main LogPlot product page. Click the Captcha check-box, and click Continue. The Free Trial tab will now display instructions and a Download button for the 64-bit (recommended) and the 32-bit versions. Click one of the Download buttons. How do I install and activate my LogPlot8 license? If you purchase a license for LogPlot, you will receive an email from our fulfillment desk with the "registration number" for your license. Keep this - you'll need it to activate your license. LogPlot8 installs as a demo. 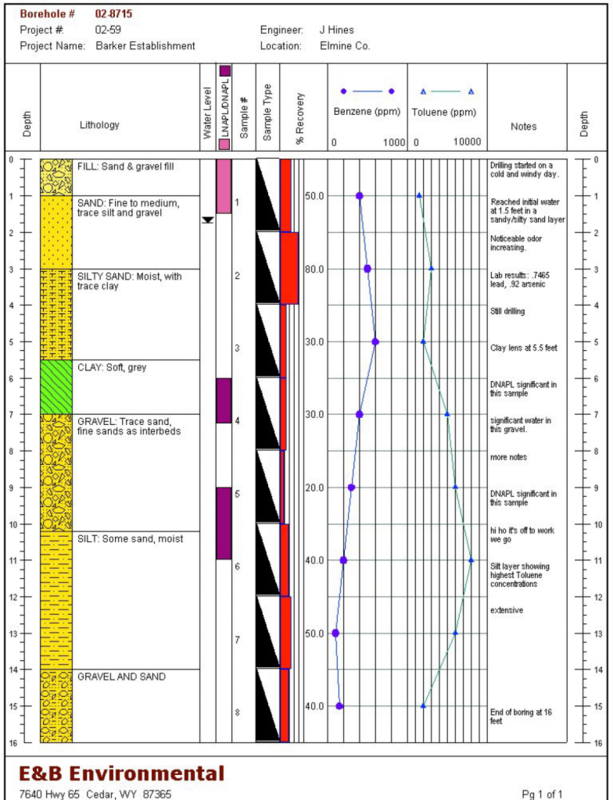 You can download the installer from the main LogPlot page on our website. Save the installer file to your computer, then run it to install the software. The trial version is fully-functional for 2 weeks. How do I unlock / remove my LogPlot8 license? Visit the LogPlot Licensing page for quick videos which show how to activate and remove Single and Network licenses for LogPlot8. How do I transfer my LogPlot8 Single license to a different computer? This is a 3-step process: removing the licensing from the original machine, installing the program on your new computer, and unlocking the license on the new computer. See also: LogPlot Licensing. Select Help | Change Licensing. Click in the Remove Licensing radio button and click Change. Right-click / Copy or write down the Uninstall Number which is displayed. Visit the Product Updates page to download the latest installation program. NOTE: If your maintenance has expired, you'll need to visit the Archives Page instead to download a revision that precedes the expiration date. Run the installation to install LogPlot. Start the program and click the Set Up Licensing button (or choose Help | Change Licensing). Select LogPlot Single as the license type. Right-click / Copy the new Installation Number displayed here - you'll need this below. Locate the license you are transferring and click the Unlock button. Click the Unlock Software button, and the Unlocking Code should be displayed on the screen. Click the button to the right to copy this long code, and paste it into the Unlocking Code prompt in LogPlot. The Registration Page for email reply. You'll need to supply your contact information, your license Registration Number, the new Installation Number, and the Uninstall Code from the previous computer. How do I transfer my LogPlot7 Single license to a different computer? This is a 3-step process: removing the licensing from the original machine, installing the program on your new computer, and unlocking the license on the new computer. Start LogPlot7 on the original computer. If prompted, click the Run Licensing button, and click OK to allow Windows to run the licensing program. In the Licensing Options window, click in the Remove radio button and click Continue. Write down the Status Code which is displayed. 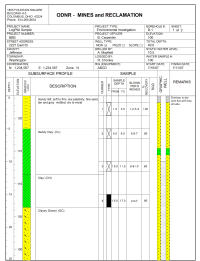 Visit the LogPlot Product Updates page. 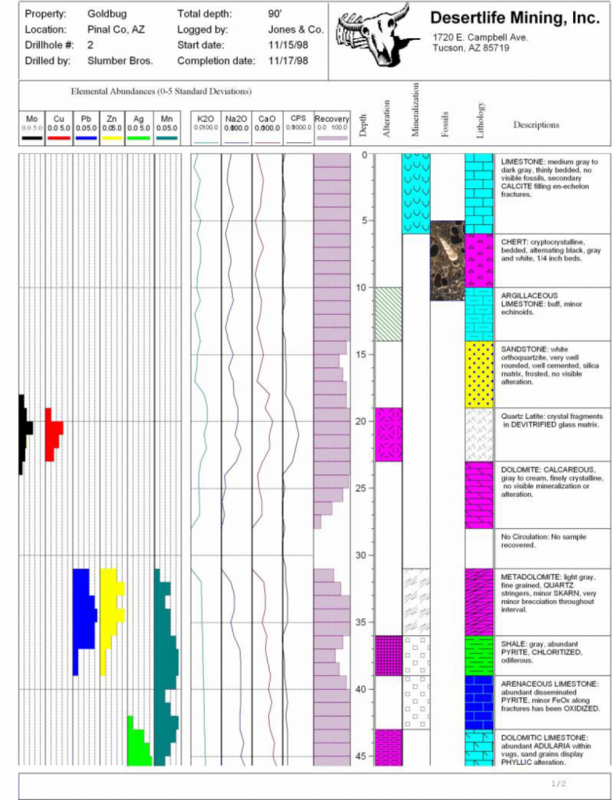 Scroll down to the LogPlot7 heading. Click the Download LogPlot7 button. Save the installer file to your computer. When the download is complete, run the installation to install LogPlot7. Read the license agreement, and click the "I accept" box if you accept the terms. On the next "Welcome to LogPlot" screen, click the Unlock Trial Version button. Right-click/copy the Installation Number displayed there - you'll need this below. 3. Request your new unlocking code by visiting the Registration Page. You'll need to supply your contact information, your license Registration Number, the new Installation Number, and the Status Code from the previous computer. Why should I keep my maintenance up to date? 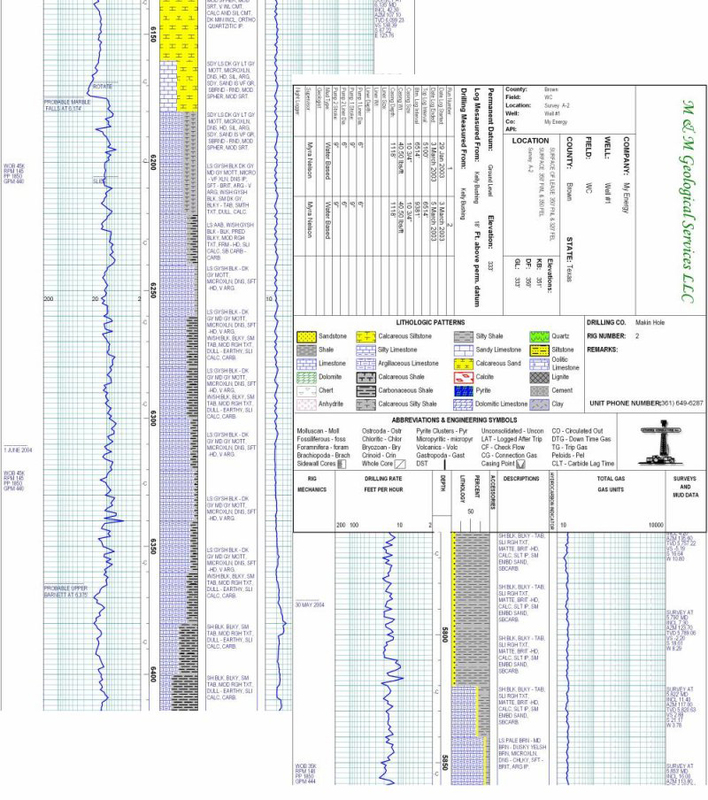 Maintenance is offered for Single and Network licenses for LogPlot. 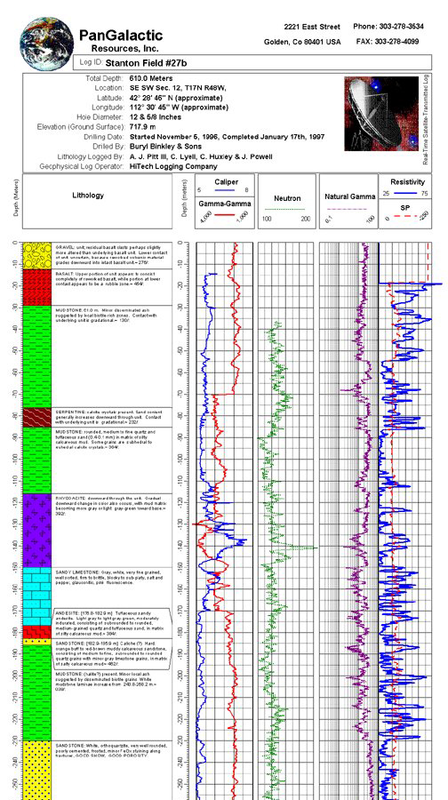 New licenses and upgrades to LogPlot8 include one year of maintenance. Maintenance includes the support options listed on our support page, as well as 30 minutes of phone support, software updates and bug fixes, and new version upgrades. Upgrades from LogPlot8 to new versions are only offered under this maintenance plan and cannot be purchased separately. If maintenance has lapsed, you need to pay the lapsed maintenance plus the maintenance renewal to get back on the plan. For more details please refer to our Maintenance Policy. 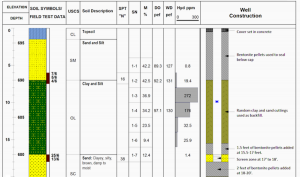 How is borehole data stored in LogPlot8? 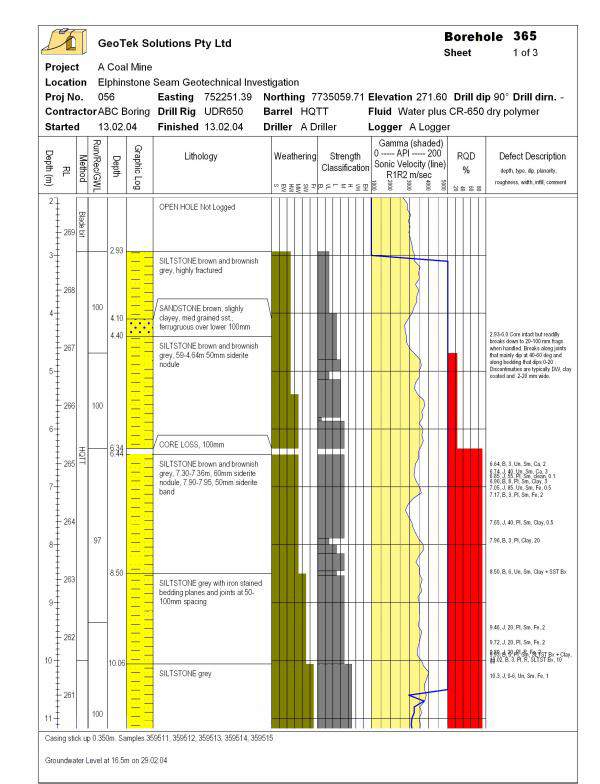 LogPlot data is stored in text ".ldat8" files -- typically with one LDAT8 file per boring or well. 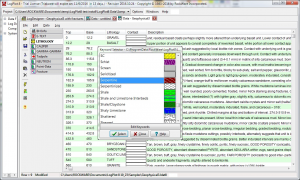 LogPlot 8 will also load RockWorks SQLite database records. See the LogPlot Data Editor page for more details. 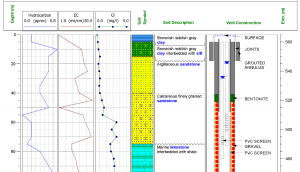 Can I create my own rock/soil symbols in LogPlot? Yes. 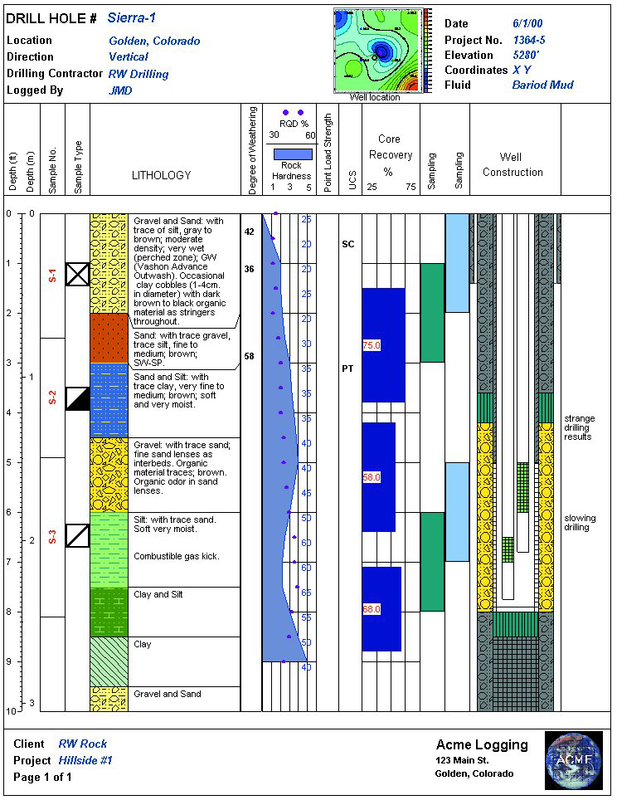 LogPlot installs with an extensive library of rock/soil symbols (or "patterns"), which are linked to an extensive list of lithology and well construction terms (or "keywords" such as "sand", "argillaceous limestone", etc.). You can create new pattern designs and keywords very easily, and delete the designs and terms you don't use. Once you’ve come up with your own list of keywords and patterns, your files can be saved and shared with others who use the software. Can I plot long, continuous logs using LogPlot? Yes. 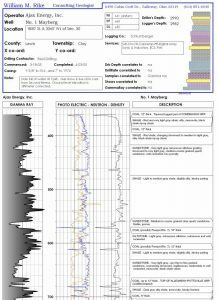 Using LogPlot, you can plot paginated single-sheet or multi-page logs, with any combination of headers and footers on each page. You can also plot continuous logs to plotters or fanfold paper printers which have a Windows-supported driver and which support banner printing. Can I import and display LAS data using LogPlot 8? Yes - The Data Editor's LAS import tool reads LAS (Log ASCII Standard) files, version 1.2 - 3 for import into the Data Editor. You can import single curves or many from the LAS file. What options do I have when plotting geophysical data as curves in LogPlot? 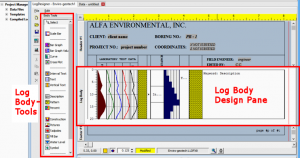 LogPlot allows the user to define curve line type, fill type and symbol type in the Log Designer. You can plot curves using a linear or logarithmic scale, and also have several choices for curve wrapping. Additionally, LogPlot has a cross-plot curve column type that will fill in the space between two curves when they intersect. Another option is to adjust the horizontal scale of a curve so that it changes with depth. See the LogPlot Gallery tab for examples. 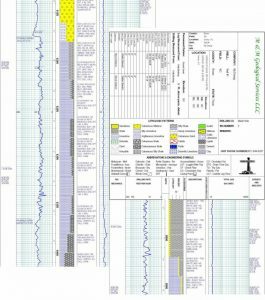 Can I show nested wells in a single well construction diagram in LogPlot? Yes, the "offset" field in the well construction window allows you to offset items to the right of left of the center of the column. 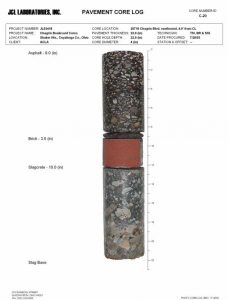 This gives you the ability to display as many casings as you want within a single bore. What is the difference between RockWorks and LogPlot? 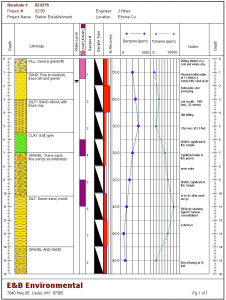 LogPlot's sole purpose is creating logs: It generates individual well/boring logs with almost unlimited flexibility in log layout, with detailed headers, footers, and any combination of data columns. You can create the graphic log at any vertical scale and print to single-sheet or continuous printers. 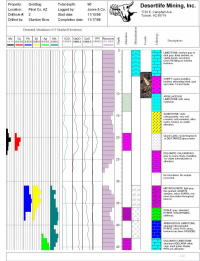 If you need detailed individual logs, LogPlot is the way to go. 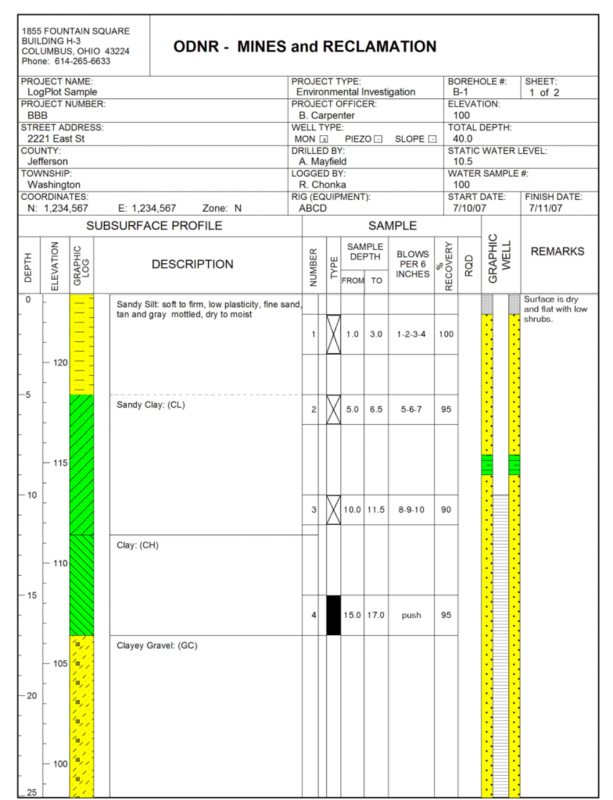 RockWorks creates more simplified logs, designed for display in cross sections and fence diagrams, and as a launching point for project-wide data interpolation and display. Logs are just a small part of what RockWorks does. 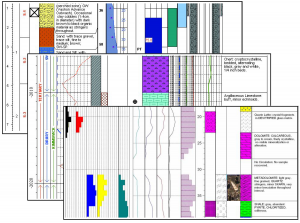 RockWorks and LogPlot can share data, so they work nicely together. They are purchased separately. Where can I get more information about LogPlot? Contact our support staff if you have specific questions or would like to schedule a demonstration. Use ArcGIS on mobile devices. This entry was posted on November 17, 2016 by admin.